This article has new content coming soon from Curse of Osiris and may not be complete, confirmed, or correct. Please update it as soon as any relevant and accurate material is available. Editors must cite sources for all contributions to this article. Edits that do not follow this standard will be reverted without notice. For more information, see the Citation Policy. "If I don't stop the Vex, there won't be anything to come back to." Osiris is an old Warlock and a former Vanguard Commander who was exiled from The Last City due to his obsession with the Vex. He now scouts the Infinite Forest as a vigilante, protecting the Solar System from any signs of the Vex. During the earliest days of the Last City, Osiris studied under the Warlock Iron Lords Felwinter and Nirwen and eventually became as legendary as them, although he never joined their order. After the death of his mentors and all of the other Iron Lords aside from Lord Saladin Forge and Lady Efrideet, the Last City was thrown into turmoil. A Warlock known as the Speaker rose to power and established the Consensus and Vanguard, with Tallulah Fairwind being appointed Hunter Vanguard and Osiris' friend Saint-14 becoming Titan Vanguard. As a veteran of Six Fronts, Osiris was a well respected warrior whose prowess at that battle convinced Saint-14 to recommend him to the Speaker as not only Warlock Vanguard, but Vanguard Commander. Osiris and the Speaker grew close, and he became the Speaker's apprentice for a time. Several decades after the establishment of the Last City, Osiris and the Speaker sent Saint-14 to hunt down and kill the Fallen mercenary Taniks, the Scarred after he murdered the Hunter Nian Ruo and several other Guardians. While Saint-14 failed to find Taniks, the mercenary was found by Cayde-6, a comrade of Nian's seeking revenge, and was believed to have ended the life of the notorious Fallen, although Taniks secretly survived. Osris attended a party thrown in celebration of Taniks' supposed demise and to welcome Andal Brask to the rank of Hunter Vanguard, which he had to accept due to losing a bet with Cayde about who would kill Taniks. "I know why you're here." "This meeting was prophesied. As is my impending banishment." Osiris' desire for truth about the purpose of Guardians and the nature of Darkness drove him to madness. His theories were not only considered borderline blasphemous, but he was also diverting Guardians and resources away from protecting the City and refugees, and towards chasing legends and rumors, such as the Vault of Glass; it's implied that he was the one who inspired Kabr, the Legionless into going into the Vault. He studied the Hive, in particular prophesying the coming of Oryx, and is also rumored to have come "too close to understanding the Vex". His obsession with the nature of the Darkness and misuse of resources eventually drove the Speaker to exile him, as the Speaker believed he had become as obsessed with the Vex as Toland, the Shattered had with the Hive. He is described as having a cult of personality, and has a number of disciples, such as Brother Vance, who attempt to see how far the Light can be bent before it can be broken. Osiris himself seems to have vanished, even from those who follow him, some claiming that he is at once "alive and dead." Before his exile, his student Ikora Rey and his old friend Saint-14 made numerous attempts to bring him back to leading the Vanguard but Osiris refused, growing more obsessed with his research on the Vex. More troubling was Osiris was growing disillusioned with the Speaker and the Consensus, viewing that a single leader ruling wasn't civilization but a dictatorship and saw the Traveler as the bringer of their troubles. As Osiris further immersed himself in his research and neglected his duties as Vanguard Commander, his growing "followers" began to spread his messages and teachings like religious works. Though Osiris resented this behavior, he did nothing to stop it and this furthered the schism between him and his former teacher, the Speaker. Though the Speaker banned his research tomes from the City, Osiris' followers continued to grow and spread his "messages", some even camping out at his old home. Even though Ikora was finally able to get Osiris to partake in the Vanguard again, he ended up getting into vicious arguments with the Speaker continuously over the Traveler, how the City was being led, the threat of the Vex and on the purpose of the Guardians. Their arguments soon began to spread amongst the Guardians, leading to fights breaking out between those who saw Osiris as a savior and others who saw him as a heretic. Finally fed up with Osiris and his hubris, the Speaker gathered the factions, Guardians and citizens of the City during a Consensus meeting, declaring Osiris a "cancer" and to be exiled immediately. Despite Ikora's defense of her teacher, Osiris himself entered and declared he would willingly leave the City but left Ikora with one last lesson and the burden of rebuilding the Warlock Vanguard. Whether before or after his banishment, Osiris held council with the other two powers of the Solar System, the Queen of the Reef and The Nine. His arrangements with the Queen extend to his followers, explaining their presence in the Vestian Outpost. He also receives reports from Eris Morn and has employed the Sunbreakers to work for him. The Disciples of Osiris held a Crucible tournament in his honor called the Trials of Osiris, where they sought to recruit the toughest Guardians to their cause. During the events of the Red War Osiris makes contact with Failsafe during the Young Wolf and their Ghost's attempt to steal data from the Vex network through nodes on Nessus. Greeting the Golden Age AI, he asked her to pass along his regards to the Guardian, whose Ghost decided that they needed to inform Ikora of Osiris' presence. Osiris finally appears in-person and serve as a central figure in the DLC, Destiny 2: Curse of Osiris. Having returned after years of exile, Osiris makes contact with his former student, Ikora Rey, informing her that the Vex from both past and future timelines are amassing on Mercury. Though distrustful of her former teacher, knowing his dangerous ideas nearly destroyed the Vanguard, she sends the Guardian to find him and determine whether he will be a powerful ally against the Vex or a dangerous enemy. It is also revealed that during his exile researching the Vex Infinite Forest, he created Reflections of himself that communicated with him and each other on Vex activities through time. Osiris' main goal is to destroy the Vex Mind directing their efforts in the Solar System, Panoptes, Infinite Mind but despite his efforts, all he could do was slow its progress. During a mission through the Vex timeline, Osiris learns of the Traveler's awakening and sees a future where the Vex succeed in their plans in dominating reality which horrifies the exile. Before he can explain to his Ghost Sagira, the Vex discover their presence and attack them. Cornered, Osiris sends his Ghost through the Infinite Gate to save her and find help, despite her protests. Sagira gets damaged during the forced escaped and Osiris goes into hiding as the Vex close in. Sagira manages to return with help in the form of The Guardian and with the aid of Ikora, they travel through the Infinite Forest to search for the exile but only find his Reflections. The Reflections guide the Guardian as they learn of the Vex's plans, showing them of the Simulant Future where the Vex have won, and of how to locate Panoptes' lair in order to destroy the Mind. However, as they succeeded in learning the location of Panoptes' lair, Infinity's Crown, Sagira gets captured by the Infinite Mind. During the Guardian's battle with Panoptes itself, they were unable to damage the Mind and as they are about to be deleted, Osiris and his many Reflections come to their aid, stopping the deletion from completing. With little time, Osiris provides Arc charges to the Guardian to disrupt Panoptes into revealing its "eye", its only known weakness. Together, they succeed in destroying the Infinite Mind forever and free Sagira, thereby preventing the dark future from ever occurring. Departing Infinity's Crown back to Mercury, Osiris is reunited with his former student, Ikora Rey. Their reunion is pleasant and they return to being friends as he is proud of her. He politely turns down her offer to return to the City as he states there are other Vex plots to prevent but before leaving, Osiris tells the Guardians that in all of his predictions, they were the one thing he did not foresee and because of them, they all now have a future. He then travels through the Infinite Gate once more to combat the Vex but tells Ikora that the path to the Infinite Forest remains open should she or the Guardians ever need him or would like to talk, to which Ikora kindly agrees. 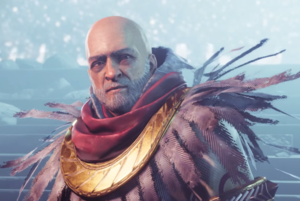 Shortly after the defeat of Panoptes, Osiris was separated from Sagira within the Infinite Forest when he returned to the dark future of the ruined Lighthouse. Meditating within the simulation as Vex wandered below the tower, Osiris was eventually rejoined by Sagira, who exclaimed that she thought they had averted this future. Continuing his meditation, Osiris answered that many equations led to this point in the timeline as a loud noise began approaching the Lighthouse, causing it to shake. Sagira questioned what they should do now, and Osiris responded that they would start their efforts anew as a massive shadow of darkness passed over them and began to assault the ruins. Confronting this new threat, Osiris told his Sagira that the first step would be resurrecting him once more. During further investigations into the Vex, Osiris and Sagira discover various Simulations on the Fallen and Cabal that would provide valuable information on the Vex to defeat them and gain complete control of the Infinite Forest. Osiris sends the Guardian to prevent these simulations from being completed and destroy the data they desired. However, during a foolish experiment, Osiris creates a simulation of Dendron, Root Mind as he believed he could control it but it begins to fill in for Panoptes within the Infinite Forest. Calling on the Guardians once again for aid, they travel to the Simulant Past and succeed in destroying Dendron for good. After solving several mysteries and eliminating several threats within the Infinite Forest, Osiris and the Young Wolf detected an old Vanguard signal being broadcast from within the Forest. Their investigation led to traces of Light that matched that of Saint-14, who had gone missing looking for Osiris in the aftermath of the Battle of the Twilight Gap. Osiris lamented his role in his old friend's disappearance, and brushed off Sagira's attempt to console him. After locating a rift created with Light near an old battlefield where Vex from across time had fallen to the famed Titan, Osiris declared that if Saint-14 remained in the Infinite Forest they had to find him and continued to search the Infinite Forest for more clues while the Young Wolf consulted with Brother Vance at the Lighthouse. With Vance's help, a location within the Infinite Forest was found with Saint-14's Light. As they searched, Osiris noted that when his old friend had entered the Infinite Forest he would not have known how easy it was to get lost and cast adrift in the shifting realities of the Vex construct, particularly when fighting the machines. In the Simulant Future the Young Wolf defeated Hagios, Reverent Mind, which had been guarding a conflux that opened a gate, beyond which Saint-14's Light was coming from. Within, the Guardians discovered a tomb filled with thousands of defeated Vex and Saint-14 laid to rest, with the last of his Light having been drained long ago. Osiris grieved for his old friend, and they decided to leave his body within the Forest, as the Vex had seemed to honor the Guardian, although the Young Wolf recovered the legendary Titan's shotgun, the Perfect Paradox, from which remnants of Saint-14's Light had been emanating. Several months later, Osiris was contacted by Petra Venj of the Reef, who was seeking aid from across the solar system from anyone who could aid the Awoken in combating the Taken curse placed upon the Dreaming City that had locked it into a three week time loop. Osiris responded to Petra's plea for aid by analyzing the time loop and reported back to her that only the Vex were capable of the fidelity necessary to reconstruct such events so accurately. However, there were no Vex within the Dreaming City, only Hive and Taken, leaving Osiris and Petra puzzled as to the source of the loop. "Crota's spawn will snuff out the worlds of Light, and Oryx's coming shall be unfettered." "Every end crawls from the same pit, rising from the schism to swallow matter, Light and life. It cannot be stopped, but here, it can be slowed. The Shrines of Oryx must be destroyed." "If the Vex succeed, it's the end of everything." Osiris is presumably named after the god of the same name, the Egyptian god of the afterlife, the underworld and the dead. Osiris was intended to appear in the original storyline of Destiny. He would act as a mentor to the player, and be found in an ancient Vex temple on Mercury. He was accompanied by a robotic assistant, who would later be re-purposed as The Stranger. At the end of the Curse of Osiris story campaign, he calls his Ghost "little light", a name the Stranger also called the Guardian's, suggesting they may have crossed paths in lore. The voice actor for Osiris in Destiny, R. Hamilton Wright, also voiced the narration for the Pathways out of Darkness ViDoc. It is unconfirmed if the narrator is supposed to be Osiris. In Destiny 2, he is voiced by Oded Fehr. Osiris was the name of a Guardian Faction during the game's pre-alpha phase. It was changed to the Cult of Osiris, though it is not a faction that can be joined. Due to his reputation, nearly every Vanguard veteran has a poor opinion of Osiris. Saladin expressed disdain towards him for nearly ruining the Warlock Vanguard and even his former student, Ikora, has called him the most notorious Guardian in Vanguard history. As it turns, Osiris would later turn out to have heroic tendencies, now working as a protector of humanity from the Vex. However, many have credited him as the greatest and most powerful Guardian in history. Ghost had even mentioned him as the "Zavala before Zavala". Osiris and his Ghost Sagira. Osiris gazing into the unknown. One of Osiris's many Reflections.